Marmoleum Countertops: All through history people have had to pick things up and put them down… especially while they are preparing, cooking or serving food. If you think about the history of shelters, there was always some kind of stone jutting out from the wall that served as a shelf for the person working at the hearth. Naturally, man has always used whatever he had at hand, until he started to become good at the survival thing and then he (and his wife) wanted to make their tools not only functional, but long lasting and beautiful. A slab of stone is about as practical as you can get, but people like variation and change and ultimately they want to introduce a little fashion into their choices. Those choices followed a very long, drawn out process of improvement, with stone and wood being about all that was available for the first few million years. The last 150 years have seen an astounding leap ahead in the number of countertop choices. Being able to transport goods around the world has made granites, marbles, woods, porcelains, plastics and composites abundant. 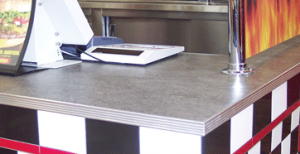 The one really awesome counter that seemed to be forgotten in history and that was invented just before plastic laminate or Formica was the Marmoleum Countertop. Made of natural materials, the product is easy to care for as long as you don’t cut on it and after that it brings all kinds of benefits to the home, like its natural anti-microbial and anti-bacterial properties. Ultimately, we are finding Marmoleum counters being used in libraries and utility counter areas all around the world but for folks who grew up with it and learned to care for it, they are still being put in today. If you love something and it is dear to you, you take care of it. Unfortunately, in our throw away society we don’t see much of that, but there are still folks putting in Marmoleum Countertops in their kitchens and they love them. The material is waterproof and strong and more than anything, this handcrafted natural material is beautiful. This entry was posted in Marmoleum Countertops and tagged kitchen, library, marmoleum, marmoleum countertops, surfaces on June 19, 2013 by MClique.